Reefing – Why? & How! As we all know from experience, Beetle Cats sail best in light and moderate winds. On the surface of it, this fact seems somewhat ironic since the Beetle is a design adaptation of the 16-30 foot Cape Cod Catboat, a popular commercial fishing craft of the 1800s and early 1900s designed primarily for heavy weather use. However, history further reveals that the commercial cats also sailed reefed most of the time, reserving their full sail area for the gentle breezes more common during the summer months. For these year-round fishermen, reefing was the norm, not the exception it is today. Howard I. Chapelle once said that “modern yachtsmen have developed an allergy against reefing.” (The Catboat Book) Many exceptions to this statement can certainly be found, but as a whole, Beetle Cat sailors are unquestionably one of the most “allergic” groups around. The prevailing attitude among Beetle Catters is that reefing is for sissies, while the prevailing practice (except for scheduled races) is not to go sailing if it gets too windy. This is a rather unfortunate situation for a couple of reasons. Hull speed in knots= 1.33 times the square root of the waterline length in feet. In practical terms, what this means is that the boat will go just so fast, and no faster, so carrying more sail than necessary to maintain this speed is, at best, a waste of power and at worst, a source of handing difficulties and possible breakage. Still Skeptical? Consider these two cases. 1. At the 1993 NEBCBA Women’s Championship held at the New Bedford Yacht Club, Andrea and John York of Cataumet decide to race their boat reefed due to the heavy weather conditions. In the first race, they were the only boat in the race sailing reefedâ€¦ they also won the race. By the start of the second race, they weren’t the only boat reefed, and they didn’t win. 2. In the middle of the 2000 Telesmanick Championship Carlo Zezza “tucked in” a reef and won the next race beating out the hot-shot sailors that were not reefed. One notable exception to the reefing “allergy” occured at Mitey Mite (under 13 years) regattas where for some inexplicable reason, it almost always blows like crazy. When this happens, the race committee very sensibly requires all boats to reef and then makes a rather disturbing discoveryâ€¦ Most of the kids don’t know how to reef. 1. Inhaul – Tie the reefing grommet in the luff down to the tack grommet or gooseneck fitting with a short piece of line using a reef knot. 2. Outhaul – Tie the reefing grommet in the leech to the boom in two directions: first out to the end of the boom. Be sure to pull it out tightly. Second, down to the boom directly under the reefing grommet. 3. Reef Points – Roll up the fold of sail between the boom and the reef points and tie the reefing lines by passing them between the foot of the sail and the boom (do NOT pass the reef lines around the boom). Be sure to use reef knots. Be sure to do the three steps in order. Make sure the leech reefing grommet is pulled out tight. (If you wind up with strain wrinkles coming from the reef pints when the sail is up, the leech grommet wasn’t hauled out tight enough.) There isn’t one right way to do this, but here is one method that does the job well and still unties easily afterwards. Thread one end of piece of 6-8 foot line though the leech reefing grommet so that half the line is sticking out on each side of the sail. Thread the ends of the line through the hole in the end of the boom (or the outhaul fitting or clew grommet) in opposite directions. Tighten out the leech reefing grommet by pulling on both ends of the line at the same time. Pass the ends of the line back through the leech grommet in opposite directions and then down around the boom. Secure with a reef knot. 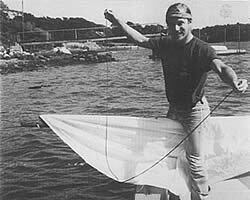 When furling the bottom of the sail, pull all of the excess sailcloth to one side of the boom and roll it up firmly. Tie the middle reef points first and work out in both directions tying the next adjacent point. (This isn’t vital, but it does produce a smoother job. 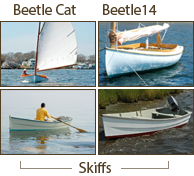 )This article first appeared in the 1985 Yearbook of the New England Beetle Cat Boat Association and has been slightly edited and updated as it appears here.